Washington (CNN) – Former House Speaker Newt Gingrich said Tuesday if House conservatives don't get their way in the congressional standoff over the budget and debt, they'll be more revved up to fight harder in the coming years, not fade away. The 2012 GOP presidential candidate and co-host of CNN's "Crossfire" also predicted Obamacare will become the biggest political issue in next year's midterms, as well as the next presidential election. 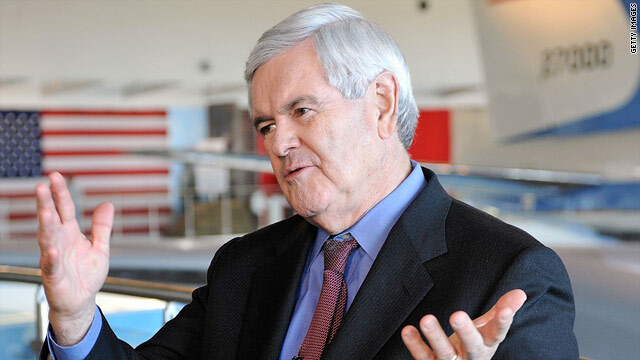 Gingrich further weighed in on John Boehner's speakership, as the House speaker in power during the last shutdowns of the federal government, in late 1995 and early 1996. Why is it that many white reporters and analysts refer to President Obama as "Obama" instead of President Obama? I have noted the respect given to former Presidents in my life time, and not until now, with a black President in office, have I witnessed such blatant disrespect of a President. Please Respect President Obama and refer to our President with respect; President Obama, NOT Obama!!!! I have very little respect for former President Bush, but I did respect the office of the President. In refer to our former President with his correct title. Innocent Americans were hurt, many more will never recover from this senseless shut down. It's too bad that so many Americans would rather let the country default, see fellow Americans hurt, and far more Americans without Healthcare all in the name of hatred and racism because we finally have a Black President. I say wake up America! This is now a minority country that is changing to finally represent the people. If the debt ceiling was not going to be raised then Ted Cruz and John Boehner should be arrested for treason. Many people that I talk to are now worried about holiday shopping. I hope and pray the American people are able to recover especially the poor and the people on furlough. I have been around for. 76 years and learned a FEW. Things in those years I do not understand the policy to spend more that you have coming in is a sound policy! It is time for some comman spence to come to Capital hill! I have come to the state of mind as a vet or say LET'S PUT SWAY POLITICS AND THINK ABOUT THIS GREAT COUNTRY BEFOE IT IS LOS!! The left likes to refer to raising the debt ceiling as the only way to prevent default on our debt followed by verbal pictures of the doom and glum that will befall us all if we don't agree to do it. That sounds smart, we'll borrow money from the Chinese so we can give it back to them as an interest payment and at the end of the day the only change is that we owe them more money. Sounds like fighting a fire by pouring gas on it to me. The Tea Party has it right, cut spending and stop borrowing. get rid of the tea party they are always cause more problems. get your problems together and get our government back in shape. I think the women to take over. and pass Obama care, if people don't like it, they can find another one. yes we also think the government should pay there own ins, as far as us older people we paid all our working all our lives and paying taxes, we should get our benefits. social security is not a problem, we earn it.